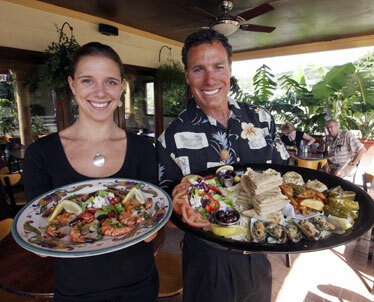 Carrie Hieb holds the Shrimp House Special while Mitch Berger shows the Fat Greek Vegetarian Platter for those who like to graze. It includes hummus, baba ganoush, dolmades, mussels, feta, olives, pita and Greek salad. As I was sitting in The Fat Greek one night, I saw a photographer from the other paper saunter in to shoot pictures. "Oh great," I thought. Not only was it likely that their review would beat mine to press by two days, but it would do nothing to dissuade some readers from believing there's a conspiracy surrounding the coverage of restaurants in this town. I've been asked, "Do you go with people from other media, or discuss where you're going, because everyone writes about them at the same time?" Well, the answer to that is a big no. As much as we would love to piggyback on someone else's expense account, it's the nature of the press to be competitive about being first, and, even though I'd visited other restaurants earlier, I had to switch plans and head over to The Fat Greek, pronto, because it's been generating so much street buzz that the other guys were likely to know about it too, and none of us want to be the last to get a word in. I haven't seen this much enthusiasm for a restaurant in a long time, and foodies seem to be mystified by it all, harrumphing that they can make better hummus and moussaka, no doubt with their eyes closed. I know where they're coming from, but for the majority who can't be bothered by the search for lamb or spending any time in the kitchen at all, The Fat Greek is a real treat and arrives at a time when people want to make healthier dining choices without sacrificing meat altogether. Foodies would also argue that this restaurant with the "Greek" moniker isn't even all that Greek. One giveaway is a secret hot sauce that appears to start with Sriracha and was creamy one week, acidic and runny the next. 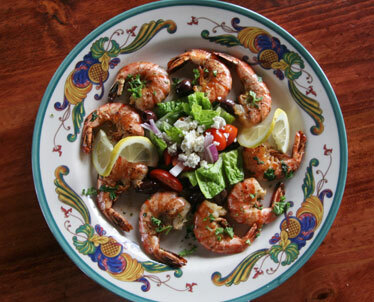 But, Greek food is just the starting point for introducing healthier Mediterranean-style dishes to a community starving for fresh, quality ingredients at a pinch more than fast-food prices. Those ordering souvlaki will find a handful of their choice of chicken, cubed lamb or fresh fish marinated with lemon, olive oil, garlic, pepper and oregano, instead of the usual processed and pressed gyro meat. Some would consider the amount of meat offered skimpy, and that's where education comes in. In many parts of the world, that much meat is a luxury, and even by Western dietary standards, the maximum of what a person should be eating in a sitting, if not a day. Given that amount of meat however, they did seem to go overboard on the tzatziki sauce. I guess that much yogurt isn't bad for you, but it would be nice to have it on the side, with the option to use as little or as much as you want. The dish is accompanied by a salad of lettuce, tomatoes and onions, with feta and kalamatas, topped with a light vinaigrette. Adding some of this to the souvlaki fills out this Greek "sandwich." A closer view of the Shrimp House Special. The restaurant setting is humble and casual, but there seems to be some big backing behind it. Among its investors is Oliver Bengough of Mint Group London, an organization that built its reputation on posh bars in London, and now is branching out internationally. With local partners Mitch Berger and Francois Provenza, they plan to open nine more restaurants in five years. I have no doubt they'll succeed. Even in a sinking economy, people will always have $10 for dinner. If not $10, then $5 for a perfectly satisfying plate of two mounds of garlicky baba ganoush served with pita slices for scooping. I love the extra touch of dried oregano flakes atop the fluffy roasted eggplant dip. Herbs and spices come jarred rather than direct from the ground, but there's still plenty of flavor to a sometime special of herbed, rosemary-accented lamb chops. It's a splurge at $19.95, but it's also more juicy and tender than that of other restaurants charging $30 or more for the same thing. For this, people will risk their lives to get to the restaurant. I urge drivers racing down St. Louis Drive to slow down for those running from the City Mill parking lot to The Fat Greek. More area parking is being sought, but will also involve crossing the street. Coming close to becoming a traffic fatality myself, I see a lot of drivers paying more attention to other cars than pedestrians, even if they're in the crosswalk. The situation is particularly perilous at night, when the height of SUVs can prevent some pedestrians from being seen until it's too late. The biggest annoyance is the way service is set up counter style. This would be OK if all customers didn't arrive all at once for dinner. All that's needed to jam up the works is a group of inconsiderate dopes blocking the counter while they study the menu and attempt to figure out what it means and what they would like to eat. Why not study the menu at a table and step up to the window prepared? Adding more confusion for the order taker is the number of people clamoring for silverware, cups, extra napkins, extra hot sauce. It's a mess that would clean up itself with a couple of servers. They're still tinkering with menu items, with exciting special ideas, including a vegetarian moussaka. They're also tinkering with the baklava, now topped with a gooey almond syrup. Really, basic honey works fine. And they're also hoping to start a drive-through pick-up service for those who want to call ahead with a minimum of fuss. But I'm really looking forward to their expansion. Come to Liliha/Nuuanu!